As many of you may remember, I sometimes do a little "background work" on the side, and in February, on an atypically somewhat sunny day, I went to work on The Killing, which airs on AMC in the States. That's right! Those are my lovely black trouser-covered legs in the background, with my left hand and my favourite brown jacket. I'm on screen for approx. 2 seconds, as I walk across frame from right to left. I was on set for approx. 5 hours, and as a non-union background performer, I was paid just over $11 an hour....and I was on film for 2 seconds. So, the next time you are watching something with a "crowd" scene that only lasts a few seconds...think of ALL THE MONEY. 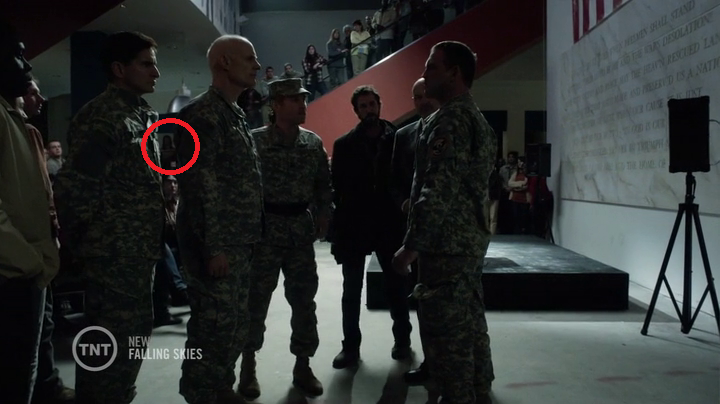 I had my second day on Falling Skies today. And it was a fine example of how boring being an extra is. My call-up time was 9:30. I was actually called to set at 5:30pm for about 15 minutes...and then again for an hour at 8pm. I was there for twelve hours. And thus ends the Adventures in Background-Work for the foreseeable future. I have far too much stuff going on in my regular life. I'm thinking that they're going to ask me back, but I'm really going to have to turn them down...which will probably piss them off a little, but them's the breaks. I also think that maybe I just get super bored doing the same show more than once. I do have to say though, that so far Falling Skies has had the best catering/crafty. I did, however, spend the day listening to Noah Wyle talk about aliens...but that's all I can legally say. The man in the white van says "Get in for the killing." I do. Wait, what? So, I can't actually talk about The Killing, because I signed this piece of paper that said I wouldn't. But, since I don't know any of the cast or the plot or anything, it's actually quite easy for me not to spoil. I never like the way they dress me, which is kind of a weird thing to say - because they always dress me in my own clothes. This time though, I got to go into hair and make-up, and they curled my hair a little. As I was walking back to holding, a woman with a broom passed me and said "Pretty!" So, that was nice. I did meet someone whose wife is going to be on Supernatural (filming tomorrow and a week from tomorrow). When she got the gig (which sounds like a straight-up acting gig), he got his agent to call and ask if they needed extras for any of her scenes - and they did! So he's doing Supernatural next week in a scene with his wife. I thought that was sweet. According to him, Supernatural rarely uses extras - "They're always so tight on their leads." Well, can you blame them? I thought it was going to be super exciting because there were a lot of "costumed extras" (like specific professions...some of which are exciting), but it turned out that there were two units filming, and I was with the second unit - which had some of the cast (I'm guessing) and not that many extras, and none of the exciting professions. We were just walking around outside of a building. I didn't even have the fun of making up a fun back story for myself (such as the lesbian teenage mother in Diary of a Wimpy Kid III)...because I was just walking across the scene. Girl: "Have you been shot before?" Girl: "I've died. I've got friends who die every single time."